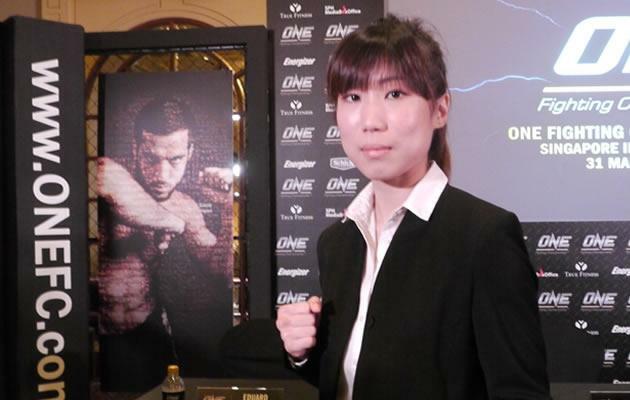 Nicole Chua is set to become Singapore's first ever professional female Mixed Martial Arts (MMA) fighter when she makes her debut in the ONE Fighting Championship on 31 March at the Singapore Indoor Stadium. The 27-year-old was unveiled on Tuesday at a press conference and will be competing against some of the region's top fighters. While Chua's MMA debut will create history in the sport, it is her full-time occupation that will truly surprise many. A full-time accountant by day, the diminutive and sweet looking girl switches from numbers to punches after work, following a strict training schedule with only one rest day per week. "I train six days a week for around four to six hours a day. So the gym is like a second home to me," said Chua, whose foundation is in Muay Thai. With most of her time spent in the gym doing a sport that continues to be a stereotype among females, Chua admitted having sacrificed time with her loved ones and friends to focus on her preparations for the competition. "My friends and family understand my passion. Of course I have to sacrifice my social life but I am still able to make time for them. My friends will be supporting me at my MMA debut on 31 March, she said, before adding, "I think it's all about time management and discipline." When asked how she unearthed her passion for martial arts, she revealed: "When I was 18, I was looking for an activity that is challenging and it was my uncle who introduced me to Muay Thai." "I fell in love with it and started training regularly," she said. "I will continue fighting for as long as I can. I believe my passion for Martial Arts will keep me going as I continue to learn and improve myself." Looking ahead, Chua is relishing the prospect of representing Singapore and hopes to inspire more females to pick up the sport. "To be honest, I'm more excited than nervous," she quipped.